An engaging and hands-on way to learn the language of health care, Stedmans Medical Terminology, 2e uses a proven work text approach that helps students master the information they need to communicate successfully in the health care world. 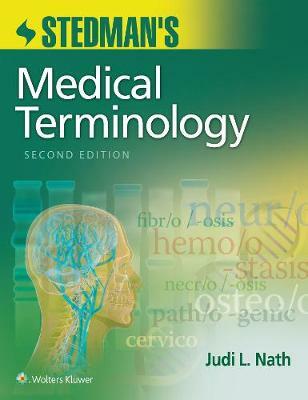 More than 4,500 questions make this the most comprehensive medical terminology resource on the market. Each chapter begins with enough coverage of anatomy and physiology to provide the context for learning the medical terms, followed by Word Part and Terminology Tables that provide strategies for figuring out the meaning of new words and connecting them to the appropriate body system. Exercises in every chapter progress in a meaningful way from recall and review, to word building, to comprehension, and finally to application and analysis. This approach allows student to a see their vocabulary grow and to connect what they are learning to a real-life context. The Second Edition has been updated to reflect the most current and actively used terms in todays health care settings, new Study Tips help students develop the study skills they need to be successful in future courses, and new PrepU icons direct students to chapter-by-chapter adaptive quizzing and more. -A new PrepU icon directs students to online chapter-by-chapter adaptive quizzing. -Reorganized chapters now align with the Memmlers Anatomy and Physiology text table of contents for cross-over consistency. -Chapter Objectives have been changed to Learning Outcomes and rewritten where necessary. -Study Tips in every chapter highlight common errors people make when working with medical terms, and give you tips for success. -An updated design maximizes images and better aligns figures to content -Updated terms and references provide the most current and actively used language in todays health care settings. -Flashcards were removed from back of the text, but are still available online. -Revised and updated ancillary materials reflect changes made in the text.